From the NM&apos;s Wide World of Forks article in the July 2016 issue. Korean barbecue makes a great summer dish. 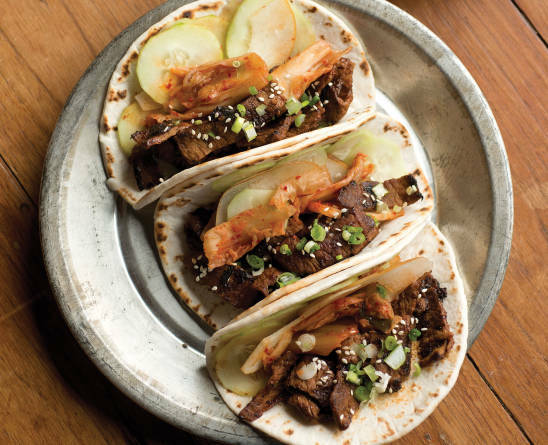 If you want to try the current food-truck sensation, the Korean taco, use the meat to fill warm corn tortillas, then top with some store-bought kimchi. Place meat in freezer for about 15 minutes while you organize ingredients and make marinade. Combine marinade ingredients in a food processor and process until smooth. Slice chilled meat across the grain in the thinnest slices you can manage. Place meat in a gallon resealable plastic bag or deep bowl, pour the marinade over the meat, and mix well. Refrigerate at least 30 minutes and up to overnight. Heat a large cast-iron skillet over high and, watching for splatters, pour in marinade with beef. Stir frequently, to cook beef evenly and reduce marinade. Most of the liquid should evaporate and meat should have some dark brown edges. Spoon onto a platter and serve with your choice of garnishes.